How about a deep pool full of spiders? That would be unpleasant. Lol same. I could tell myself all day that there isnt a shark in the water, but if you’re swimming in the deep end (especially on a back stroke or something) it’s really scary lol. And may I be the first to say, dude, you have a massive package. I think I can understand this. I know I’d be absolutely horrified of swimming in a deep trench or some other large open chasm. It’s even sadder that it took a whole year to lean basic make-up. The mouth of a snake just isn’t stable enough to hold brushes, and they were too small to coil around them. Damn You Clown College! Damn You. What if said spider with snake arms aspiring to be a clown were in deep water?! I hear this fear is more common then we realise! My fear of water comes from me being unable to see the bottom. I don’t care how deep the water is, but if it gets to murky/ dark for me to not be able to see the bottom thats when I start to freak out. Is that a spider in a clown college on a disability scholarship because he’s got snakes for arms in your pants or are you just happy to see me on the first panel? I’m terrified of your enormous junk. It looks like you had to fold it back just to fit it all in there. Gah! I’m afraid of being near a balcony on the 2nd or 3rd floor of a building, NO JOKE! I have a similar fear, but in me it’s triggered more at random. 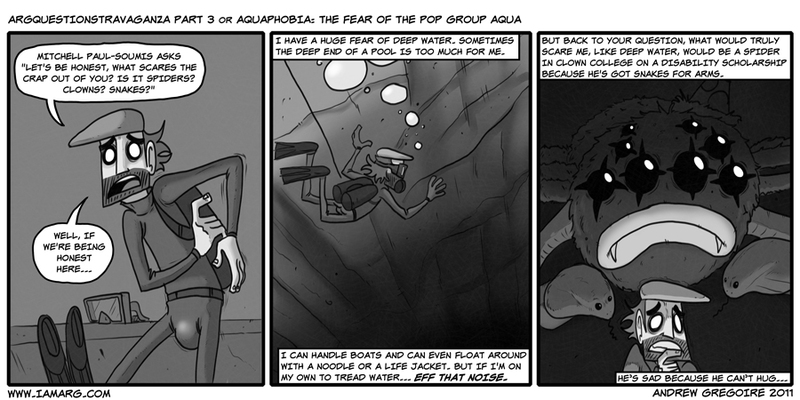 Now, yes, I have a huge fear of deep water, but sometimes my phobia can be triggered by something ridiculously small. (Once it was even triggered by a glass of water! Only once, though.) Other times I can withstand swimming in the middle of the ocean without fear. There is however one thing that fails to frighten me: whales. I used to love them, but at some point in my life I became deathly afraid of them. Probably because you’re afraid they would piss on your house. Very manly buldge bud, lol! Also he breathes underwater, doesn’t he? Truly nothing more terrifying. Awesome, that so looks like it should be an elder god that rose out of the dark depths.